First day was spent getting to the hotel, the same as last time, Dormy Inn in Akihabara. Traveling from the airport was hard with our bicycles, both suitcases being difficult to get through the train stations. Still, we managed a good dinner, in the UDX building, and made trip to the rooftop bath before bed. Second day was the Halko Momoi trip, starting in the famous resort town of Atami. Hitomi explained it as a hot springs tour, but the style, as stated by Momoi, was more similar to a school field trip. There were about 140 fan club members there, obviously all big fans of her. Most fans were 20-35 year old males (otaku), though a few older and younger. Maybe 20 females? And somebody's parents. And there was actually a fan from Seattle, Anthony, who I had never met, but who had met Hitomi at Anime North (Toronto). Schedule: Meet for orientation in the lobby. There were a number of "Momoists" who Hitomi had met from different international conventions Momoi performed for in the U.S., Toronto, Canada, and Kassel, Germany. Online they meet and collaborate on fan events and materials, such as call books, some of which I've translated. Hitomi brought a present from her international fans, which was a photo book put together through the internet and she painstakingly assembled prior and during the trip. Dinner was an enkai, a traditional Japanese style of banquet where you sit on zabuton (on tatami) and eat an elaborate meal off of multiple trays and drink a lot. Given what I read, I thought we might just eat, listen to a couple of words from Momoi, and call it a night. But Momoi talked throughout, discussing how her 2008 went, various funny and frustating events throughout the year. I should have taken notes, but we were told not to post anything online. When dinner wound down, there were a couple of contests. First was a karaoke contest where fans were asked to come on stage and sing on the karaoke box loaded with her songs, without looking at the lyrics. Of course, first up was a tricky song (from her early days) that even Momoi herself couldn't always remember the lyrics for. And it turned from less of a concert into just people having fun: Momoi helped out a lot and the otagei folk gave their assist. It turned into something fairly reminiscent of her performance in Hawaii where Momoi with her wireless microphone wandered around and a friendly crowd with glow sticks surrounded her and did their calls. Winding down was a bingo game. Unlike most bingo games I've played, just numbers are read off, not both letters and numbers. Effectively, there was less probability a of bingo per number called. Prizes were handed out. Hitomi got bingo and she forced me to the stage. Winners were asked (by the audience!) to sing or dance. I wasn't quite up for that. I guess I should have memorized some songs. I asked them politely to leave me alone. Momoi was a bit sympathetic as her fans are demanding. I got her signature on a picture frame and a "Thank you!" A hug would have been nice but would have made her fans mad. Third day: We had breakfast on our own in the cafeteria, enjoying the "Viking" (all you can eat) selection of Japanese and European breakfast food. Around 10 or so, we all boarded buses, which were to take us to Hakone for BBQ. It was less of an American BBQ and really just yakiniku, meat grilled on a gas stove. Momoi ran around making toasts and stealing off of hot plates. We got to see Hakone from the bus, as well as Mount Fuji, but had little time to walk around. We went off for bowling. It was a good choice of game for 140 or so people on the tour. (Compare to, say, baseball or some other team game.) I'm not good at bowling and neither was our team, but eventually I got the hang of it. A lot of others wore out physically, but I managed to not feel worn out at all. Prizes were handed out for highest team and individual and lowest scores. I felt like I should practice back in the U.S. With a bit more consistency I wouldn't feel as pathetic come next time. On the bus, we watched a video of Momoi performing in Taiwan. The concert was during a typhoon, but yet her fans made it anyway. Her fans were singing along and doing their calls. (Though as the evening went on, people toned it down.) We were taken to Shinjuku station and made our farewells. It's hard to choose where to eat in Tokyo since there's literally hundreds of places around the major train stations. We found some sort of "back alley" section near Shinjuku station where restaurants had somehow escaped urban renewal. While wandering around, I found a place run by, literally, a mom & pop, who might have been pushing 70+. And evolution suggests that any highly competitive environment produces species adopted to that environment. Given that, and how Japanese are also obsessive about food (see: Japanese television) and fastidious otherwise, we were in prime territory for a good meal. And cheap as well. Fourth Day: It was prime weather for bicycling. I set our bikes up in the small room somehow and we set off for a short ride in town. Hitomi wasn't too keen on riding in the city streets, but like Taipei and Seattle downtown, traffic is fairly forgiving, since drivers are more attuned to stopped cars (on the side), pedestrians, and frequent stops. Eventually we made it from Tokyo to the Emperor's Place near Tokyo station. Initially I was going to find some back roads, but given the number of bridges and odd angles to the streets it was simply easiest to navigate on the major thoroughfares. 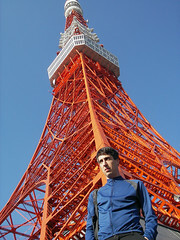 We road around the palace grounds, took a few photos, and headed toward Tokyo Tower, off in the distance. Akihabara is the place of Maid Cafes. The one we went to is located on the top of some building, with gashapon and figures and premade cosplay clothing on lower levels: A layer cake of otaku-dom. Hitomi bought tickets to angela's concert. They were one of the first bands to come to Sakura-con and perform back in the Hilton at Sea-Tac and since then Hitomi's been a fan and even had attended a concert earlier in the year. Masaki and his new wife, Chiho, as well as Mr. Nagahama, director of several anime were in the same section. We briefly said hello before the performance. Post concert we were invited backstage and talked a little bit with Masaki, Chiho, Nagahama and were briefly introduced to atsuko herself, and Yui Horie, who I didn't immediately recognize. (I think being tall changes the way people look.) Hitomi helpfully explained we did come all this way to Japan for the concert; a bit of a white lie. Obviously we were in the midst of a lot of industry people, e.g. producers and performers and the famous, and I was the 190cm tall foreigner so I might as well been a celebrity. We said our goodbyes and it was back to the hotel, and the rooftop bath before bed. Fifth Day: Comiket (Comic Market.) Hitomi wanted very much to by Momoi's (first) dōjinshi, which was a collection of articles and pictures and thoughts she put together and left early in the morning to fight the throngs of otaku. Given the crowds, I had considered skipping it entirely and making my way out of town on a train for a bike ride but I hadn't been in many years and felt: Why not? I took a combination of subway and train to Big Sight, and given I was riding around 12PM it was not crowded at all. Hitomi left me money but I had forgotten it and thus had arrived without any cash. Not a good thing in Japan. Still, eventually I found a Post Office ATM and later Hitomi and was okay. Crisis averted. Dinner was okonomiyaki at UDX, followed by shopping at Tora no Ana, Tachibana Shoten, and back to bed. This entry was posted in Uncategorized and tagged akihabara, angela, anime, comiket, cycling, dakimakura, momoi, nagahama, tokyo, tora no ana. Bookmark the permalink.